we started going through them & I really couldn’t pick just 5! I could have easily picked out 20 as she just seems to love them all! However we settled for 10! these are both our favourite books – she has a few that I dread her choosing that she would probably class as faves but I’m going to be nice and not share them with you as then you’d also have to suffer the annoying stories that I dread having to read. 3) Please don’t chat to the bus driver. This is one of Safiyah’s newest books & I can’t believe how much she loves it. Some nights we read it 3 times back to back and she giggles every time! A book about noisy, naughty animal passengers that distract the bus driver with very silly results! 5) Oh Dear. Grammy bought S this book as it was either mine or my sisters favourite she clearly doesn’t love us as She can’t remember. It’s very simple and probably suited to someone younger but it is still one of Safiyah’s top books with lots of flaps to lift. It’s by the creator of ‘Dear Zoo’ which could have also made it onto S’s top 10 list! 6) Toddle Waddle. One of my least favourite but she loves it so how am I to argue. Very simple – not much of a story. A follow-the-leader type story. 7) The very hungry caterpillar. Is there anything more to say on this book – S has the pop up book version and loves it. 8) Peace at last. I love reading this book, such a good story with lots of interesting noises to keep her engaged. 9) The Gruffalo. A classic – I think every child loves the Gruffalo – a story about a quick thinking mouse! S actually used to be a bit scared of this book but now loves it. 10) We’re going on a bear hunt. One of my all time favourite childhood books! I can’t get enough of this story! Thankfully S loves it just as much as me. This is a good one for day time reading as its great to do all the actions and go on a real life bear hunt round the living room! 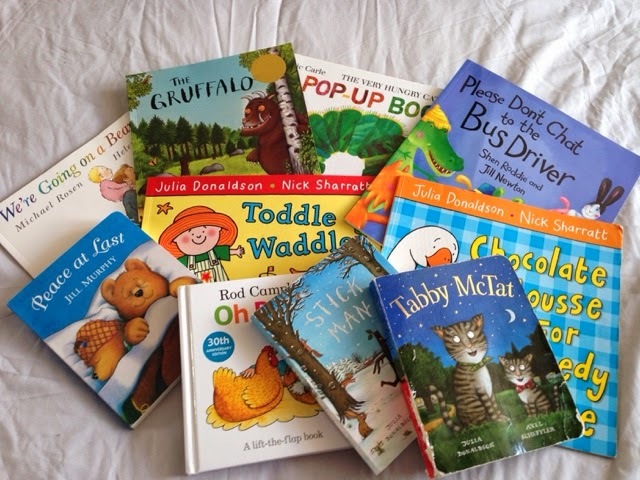 I feel like I’m meant to think that any book is a good book and and as long as kids are reading it’s a good thing…But there really are some poor quality children’s books out there – I know as we own a few! I can honestly say that we both enjoy all of these books, S loves listening, looking at the pictures & saying the odd word that she knows is coming – especially with the rhyming ones. What are your favourite children’s/toddler books? I love adding to and expanding Mini Meldrum’s library!